Steven Silverberg from our science team recently traveled to Chile again, as he did in October 2015. Here’s his story on our most recent observing run. 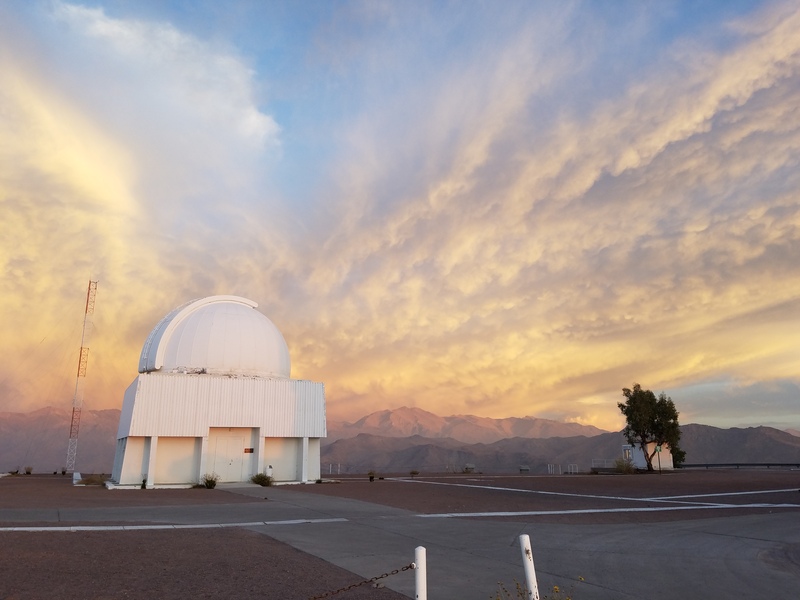 Last December, Disk Detective applied for and was granted time at Cerro Tololo Inter-American Observatory, the Southern Hemisphere counterpart to Kitt Peak National Observatory in Arizona. I traveled to Chile last month to conduct the observations. Due to an issue with flights, I unfortunately missed our planned first night on the telescope. However, I was able to get up to the mountain for nine nights of observations with the 0.9-m telescope, as well as half a night with the 4m Victor Blanco Telescope. There are quite a few telescopes on the mountain. 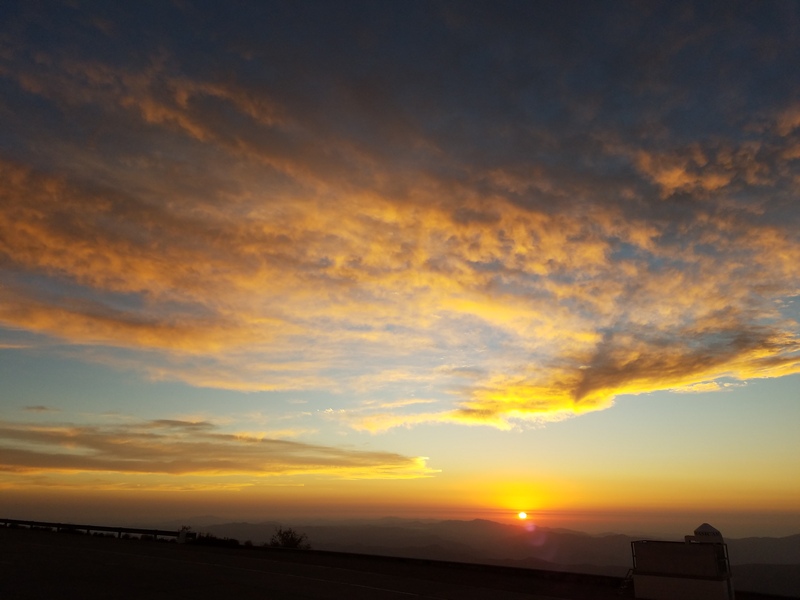 In addition to the 5 telescopes that belong to CTIO (the 4m Victor Blanco, and the 1.5m, 1.3m, 1.0m, and 0.9m telescopes run by the SMARTS consortium), there are a slew of other projects hosted on the mountain. The collection of domes makes for a rather impressive site–especially when viewed from the lodge at dawn. Sunrises were a thing of absolute beauty coming over the mountains, from anywhere in the complex. This was from the lodge. My first nine nights on the mountain were spent with this telescope, the 0.9-m. While not the biggest telescope, it proved quite capable for our mission: monitoring AWI0005x3s (from Paper 2) for flares and other stellar activity. The activity we detect in these observed light curves could give us more information as to its age, and could provide information on how the star and its disk might interact. The next mountain over (or what seems like it) is Cerro Pachon, home to the SOAR telescope, another telescope run by CTIO. This mountain is also where the Large Synodic Space Telescope (LSST) is currently under construction. Seeing our “neighbors” from the summit of Cerro Tololo was quite nice. The most notable result from our initial analysis is the light curve from night 4, where we observed this flare. It is rather impressive, both for its duration (~1.8 hours) and its brightness (3 times the non-flare brightness at peak). This flare, any others we find in the light curve, and any other interesting features we find in the light curve will be the subject of a future Disk Detective paper. Sunrise on the morning of night 5 was particularly beautiful from on top of the mountain. The view from the dining hall at the lodge was rather spectacular, as well. You can see what appears to be an ancient riverbed in the valley. Sunsets could be particularly delightful, too. This one’s beauty comes from some rather annoying clouds, but these fortunately never came into play for our target of interest. We had fairly good observing weather throughout the run. In addition to our time with the 0.9m telescope, we also had time on the 4.1m Victor Blanco Telescope, using the COSMOS instrument. We used this spectrograph to get what we believe is the first optical spectrum recorded of AWI0005x3s. That would give us more accurate information on its spectral type (and temperature), age (to confirm membership in Carina), and potentially radial velocity (also to confirm Carina membership). All in all, traveling to CTIO was a fantastic experience. I gained some valuable practical experience for future observing runs, and we got what should be some quite good science out of the observations. Keep checking back here, and you should see more on what we learned from our observations soon.